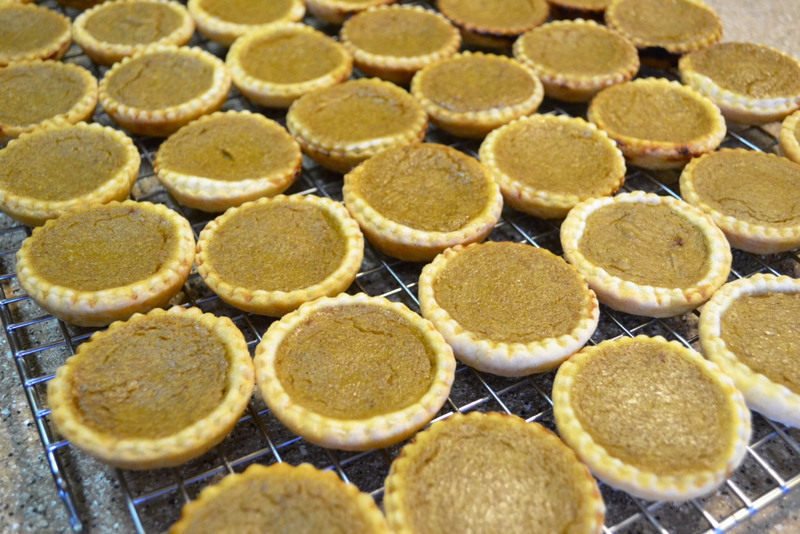 Over at Julie's: 48 Little Pumpkin Pies Using Will's Homegrown Pumpkins! 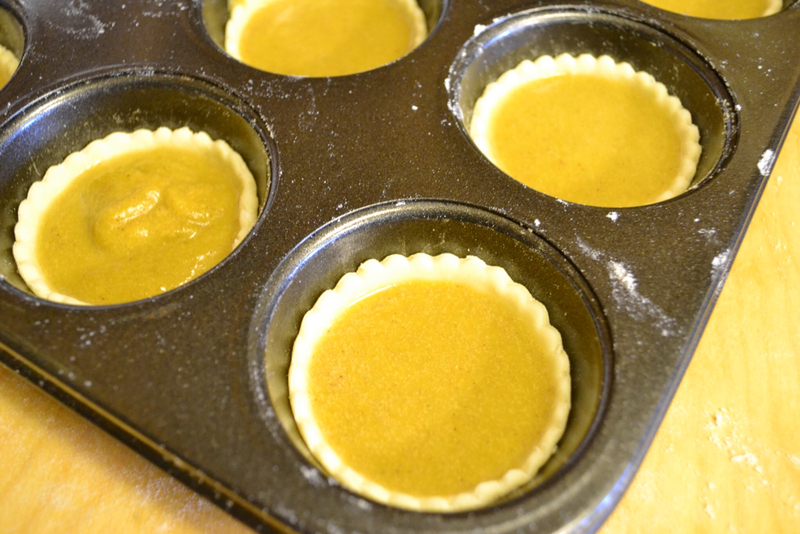 48 Little Pumpkin Pies Using Will's Homegrown Pumpkins! Our family loves getting together to for the 4th of July, America's Independence Day celebration! Our children, their children (the Grands) and of course, Will and I gather at Jason and Annie's for food, fun, swimming and end our evening by watching local fireworks! This year our friends Tino and Elsa joined us! Jas, was barbecuing baby-backed ribs and chicken with his new hybrid grill, a Father's Day gift. I promised to make my now "world famous" Homemade Potato Salad (thanks to all you devoted readers! ), and deviled eggs . . .
. . . I picked one of Will's pumpkins, to see if it was ready, (yes, it was); baked it, and then thought, "I know what I'll do! I"ll bake Little Pumpkin Pies!" They are perfect for little hands and mouths, and would make a wonderful surprise in school lunches! 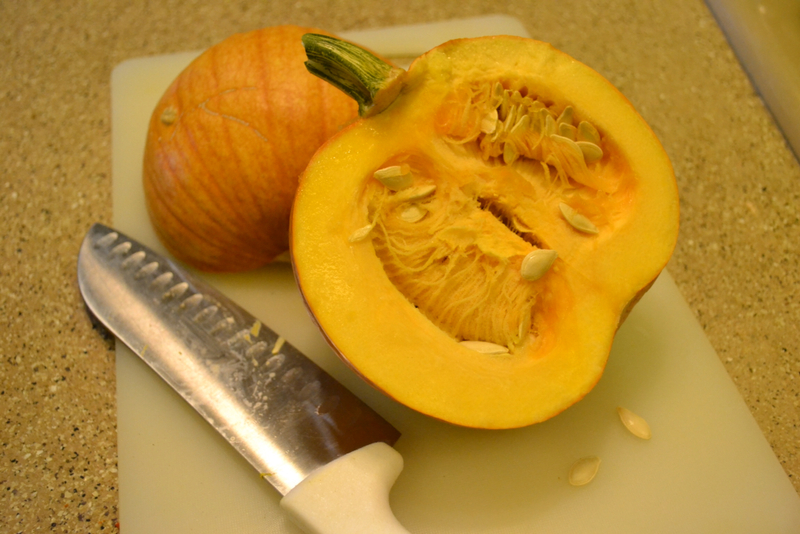 This is one of Will's smaller pumpkins, weighing in at just under 3 pounds; the perfect amount for this recipe! I chose Momma's Pumpkin Pie recipe, with the perfect combination of spices, and my easy ~ Flaky Butter Crust recipe . . . I had enough pumpkin and butter crust to make 48 mini pies! In a large bowl : Add pumpkin. In a small bowl: Whisk together flour, ginger, cinnamon, mace, cloves, and salt; removing all lumps. Add whisked flour/spice mixture to pumpkin and stir well to incorporate. Add melted butter; mix well. In a separate bowl: Beat eggs; stir in sugars, and milk. Stir egg mixture gently into the pumpkin. Place cubed, chilled butter, flour and salt in the food processor. Pulse until the mixture resembles pea-size particles (don't over-pulse). Add ice water 1 tablespoon at a time; pulse twice after each addition. Continue adding water and pulsing until dough comes together in large clumps. Divide dough in two and place each piece into a sealable sandwich bag; pat each into a flat disc. Roll out dough (see TIP); cut into circles using a large biscuit cutter, aprox. 3-inch. 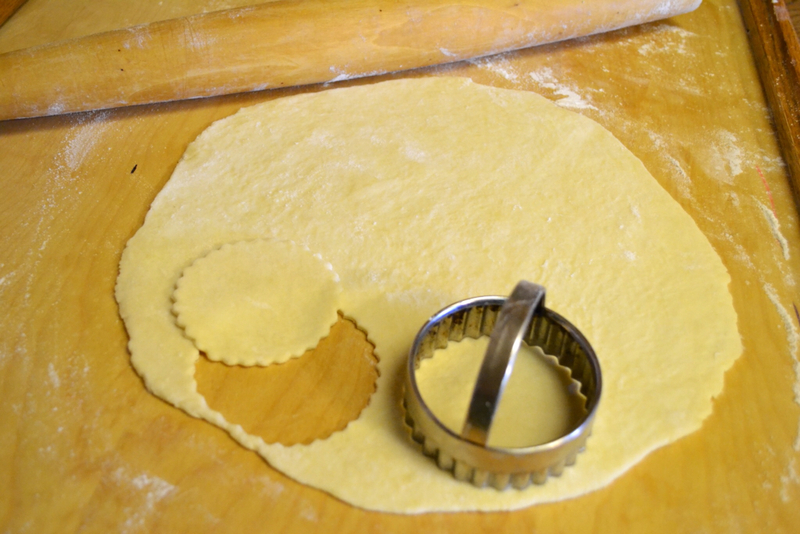 I used a fluted biscuit cutter to mimic a large pie crust). 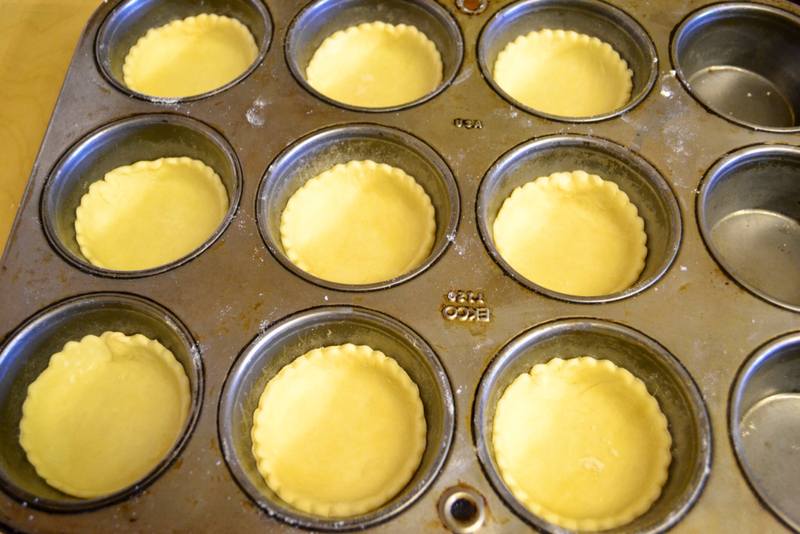 Tuck mini crusts into muffin tins, adjusting to make sure they are even. Spoon in filling, leaving a 1/4-inch of crust showing. Bake Mini Pies 5 minutes at 425F. Reduce heat to 325F and bake an additional 22 minutes, or until a knife inserted in the center of pie comes out clean. Remove pies, and cool on wire rack. Refrigerate; serve with sweetened whipped cream. TIP: I begin by patting my dough into a 6-inch disc. Next, I pick it up and add a light dusting of flour beneath. I roll the dough out working from center towards the edge facing you. By making a quarter turn of the dough, you keep it from sticking and keep the section you are rolling out (from the center) in front of you! Easy peazy! Leave a 1/4-inch border of crust above the filling. 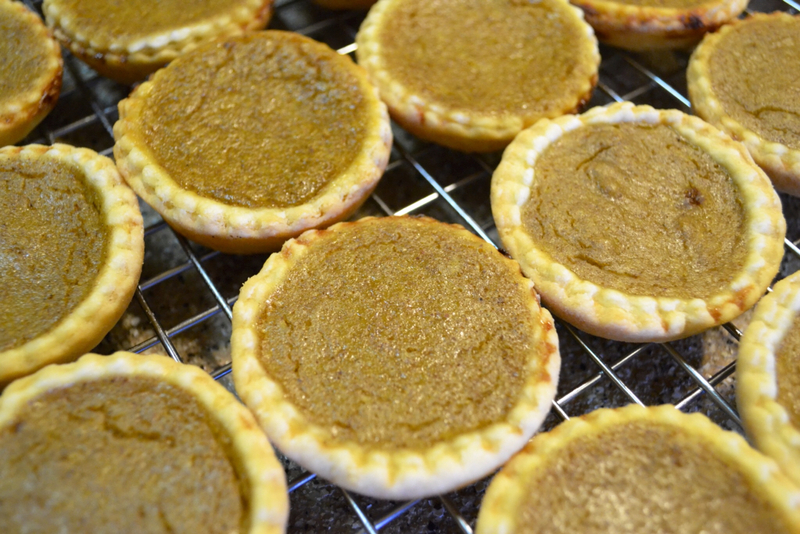 Spicy pumpkin goodness in a super flaky butter crust! Happy Independence Day, America!!! 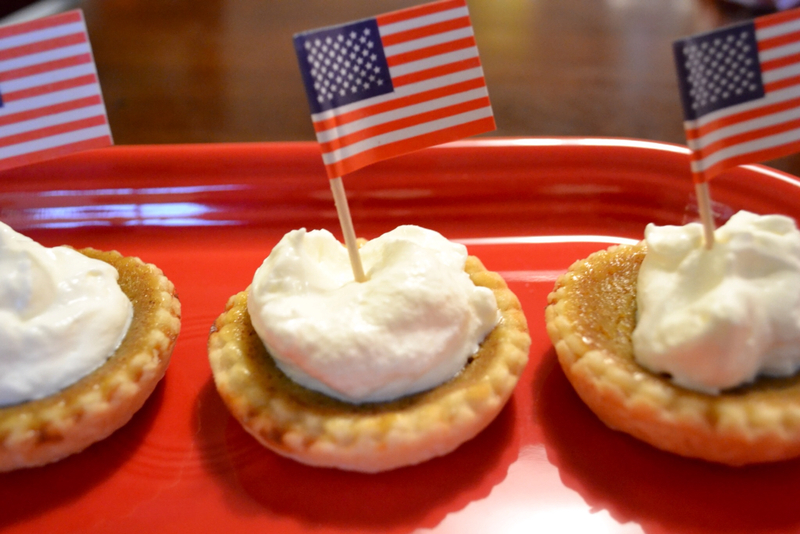 What could be more American than pumpkin pie? Well, the potato salad and deviled eggs were devoured, but the biggest hit was the dessert! 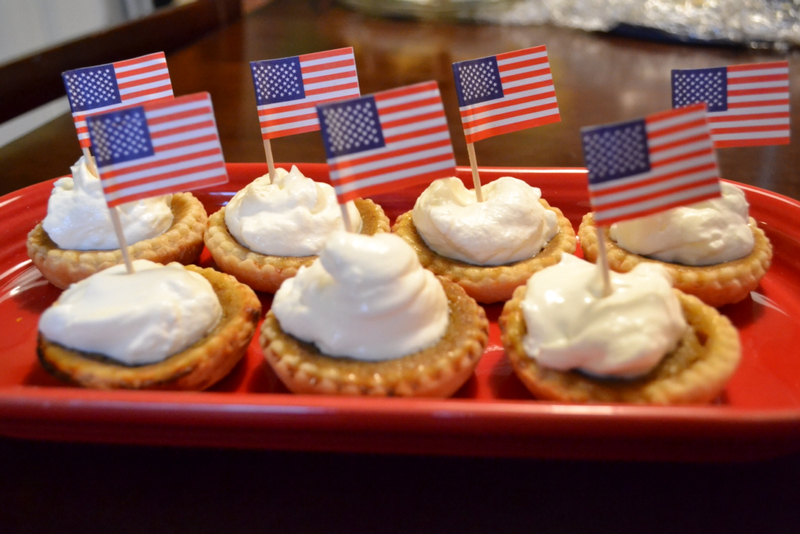 Kids and adults alike, couldn't get enough of the Little Pumpkin Pies! I can promise you, and them, I will be making these Little Pumpkin Pies again and again . . . Over at Julie's!!! It was wonderful that you could join us! We really did have quite a feast! Well lets try this again. I posted yesterday but nothing posted when I clicked publish. Anyways these were fantastic. They were flaky and the filling was just so good. Topped off with homemade whipped cream. They were a huge hit with my family! Im going to have to learn how to make the bottoms! I must admit, I was thrilled with how flaky the little pie crusts were! Our family has been using my Momma's pumpkin pie filling recipe as far back as I can remember, so I knew that would be good, especially with Will's homegrown fresh pumpkin! Making pie crust is not much different than making biscuits, (and you make great biscuits") except for the rolling out the dough part . . . And if you follow my "TIP" on rolling out the dough, you shouldn't have any trouble!